Undated photos of Khairullozhon Matanov. The FBI launched intensive surveillance of a friend of the suspected Boston Marathon bombers last year, tracking him by car through the area and at one point urging him to stay away from Boston on the Fourth of July, authorities said Wednesday. McElroy said the FBI also asked Matanov to stay away from Boston’s July 4 festivities because “for obvious reasons, the city was on edge.” Matanov was also asked by agents to avoid Boston on Patriots Day, or April 21 of this year, when the first Boston Marathon since the April 15, 2013, bombings was held, McElroy said. He said that the 23-year-old cab driver from Quincy, who by then had obtained a lawyer, complied with the requests. 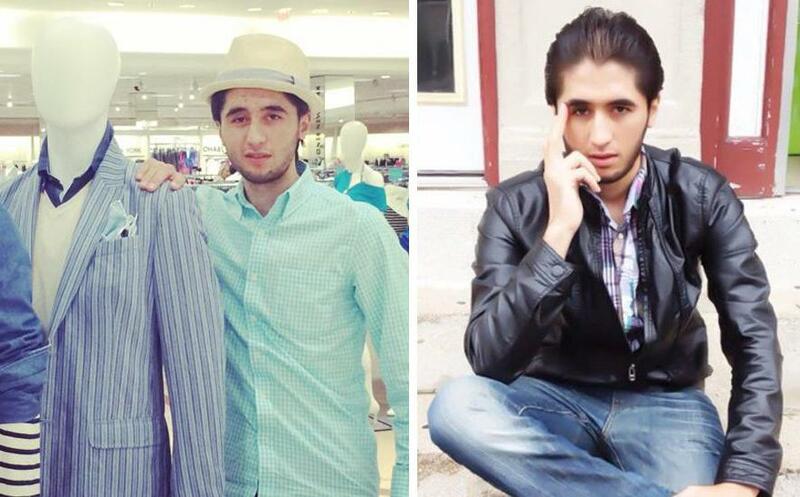 Matanov had first contacted authorities four days after the bombings to say he knew the Tsarnaev brothers. He was arrested last week on charges of obstruction of justice, accused of allegedly destroying computer documents in an attempt to hide his relationship with the Tsarnaev brothers. Prosecutors said he also lied about interactions he had with the brothers during the week of the bombings, including a dinner the very night of the attacks. McElroy, who assisted in the arrest of Matanov last week, revealed the surveillance at a hearing Wednesday to determine whether Matanov should be held pending a trial on the charges. In asking that he be held, prosecutors called Matanov a flight risk, saying he is not a US citizen, has no community support or assets, and he has extensive family and resources abroad. Matanov shook his head in apparent disagreement. Dressed in orange prison garb, Matanov, a native of Kyrgyzstan, loudly pleaded not guilty in a thick accent. Prosecutors said a trial could last two to three weeks, with 20 to 30 witnesses. He faces up to 20 years in prison. minute hearing in US District Court in Boston that he could not credibly contest the request to keep Matanov detained, acknowledging his client would have no job and no place to stay, and had little money to post bail. Matanov was ordered held. Hayden used the hearing and the cross-examination of McElroy, however, to provide his own interpretation of Matanov’s interactions with the FBI and his relationship with the Tsarnaev brothers. It was also disclosed that Matanov bought dinner for the brothers at the Man-O-Salwa Kabob & Grill in Somerville on the night of the bombings. Hayden said Matanov contacted Braintree police April 19, the day after authorities released photos of the suspected Marathon bombers, and he identified them as Dzhokhar and Tamerlan Tsarnaev. He also provided their addresses and phone numbers. By then, authorities had identified the brothers, after they had a violent confrontation with police in Watertown and Tamerlan was killed. Authorities were still searching for Dzhokhar, however. Hayden said a Braintree police detective thought Matanov’s information was so material, he wanted to call the FBI right away. But the agency did not contact Matanov until the next day, the Saturday after the bombings, Hayden said, questioning whether the bureau believed him to be important. Prosecutors say Matanov gave FBI agents differing accounts of how he came to learn the Tsarnaev brothers were the alleged bombers. He said he learned that Friday, April 19, 2013. But prosecutors say he deleted computer information showing he realized they were the bombers the previous Thursday, after the FBI released its photos. Hayden sought Wednesday to minimize Matanov’s interaction with authorities. He did not contest that Matanov deleted information from his computer, but said it was immaterial to the investigation. He acknowledged that Matanov tried to give away cellphones to two witnesses, telling the witnesses they were illegal and the FBI could find them in a search of his home. But Hayden argued that the phones could be illegal for a variety of reasons. “Even if it has nothing to do with terrorism?” he asked. McElroy agreed. Hayden also downplayed allegations that Matanov denied being a friend of the brothers. He said his client clearly told authorities that he boxed with Tamerlan, played soccer with him, and went to his home in Cambridge and met his parents. McElroy also testified that authorities believe Matanov wired money to people abroad 114 times from 2010 to 2013, totaling more than $71,000. Many times, he used aliases. The money went to 15 different recipients, and prosecutors argued that the money shipments showed Matanov’s extensive contacts in foreign countries, including Egypt, Turkey, Uzbekistan, Jordan, and Greece. Hayden argued that most of the money went to Matanov’s family members. The defense attorney also sought to show that his client did not attempt to flee even when he first thought the FBI was tracking him. At one point in May 2013, a month after the bombings, Matanov realized an agent had followed him to Boston University, and he started a conversation with the agent, McElroy testified. That same month, Matanov started to drive “recklessly” on the highway, in a possible attempt to evade authorities, McElroy said. He said the FBI asked Matanov’s lawyer at the time to advise him to follow public safety precautions. Globe correspondent Claire McNeill contributed. Milton J. Valencia can be reached at mvalencia@globe.com.